For all the talk about how social media platforms have ruined art, literature, attention spans, cinema, etc. – could it be possible that digital platforms may also become the connective tool that links a new generation to art, and re-ignites traditional forms? This week, to celebrate Black History Month, Snapchat has launched a new Lens which invites users into a virtual art gallery and showcases the work of black Millennial artists. There are some amazing artworks on display here, from artists who many Snapchat users would never have heard of, providing an opportunity for exposure and connection with new audiences. The whole gallery you see in the above clip is simulated – the option is accessible by either tapping on a new rainbow-colored Lens in the carousel within the app, or you can scan in this Snapcode. As explained by Mashable, when you first open the Lens, you’ll see a selfie frame with a Black History Month banner, but flip the camera and you’ll be taken into the AR gallery. This is not the first time Snapchat has sought to boost exposure for artists. 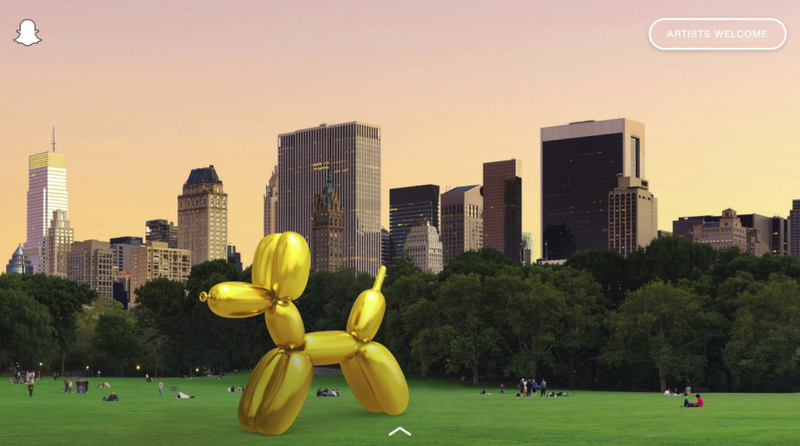 In late 2017, Snapchat launched its AR art installation project, which virtually placed large-scale artworks in public places, where users could then view them through the app. Facebook has also worked on similar, with artist Heather Day using its SLAM (simultaneous localization and mapping) process to link digital artworks to specific spaces. Given such developments, it’s possible that technology could facilitate a range of new connection opportunities for artists, particularly with younger audiences, and that could then fuel a greater connection with art, and even inspire them to explore their own creative options. While, as noted, much has been said about the impacts of the rise of social media and digital communication on traditional art forms, the potential is there for them to also fuel discovery, and become a compliment for art appreciation. It’s not the same, and it may not have the same effect as traditional artistic display and presentation options. But it could still provide expanded opportunities for modern art practitioners, and enable new ways to inspire future voices.